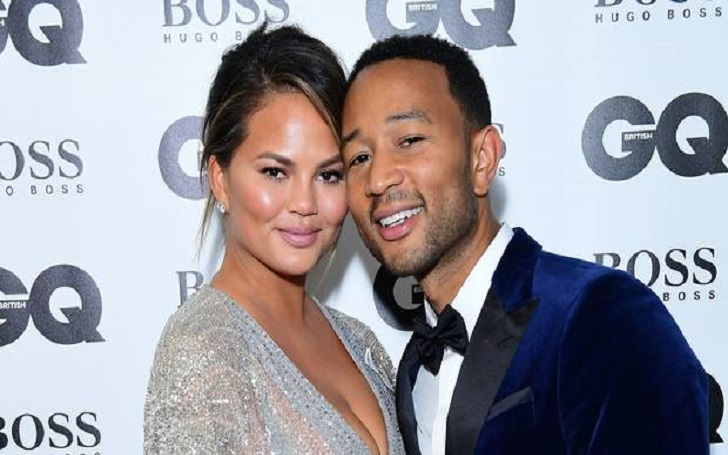 Chrissy Teigen has made her first red carpet appearance with husband John Legend since giving birth to the couple's second child, son Miles Theodore Stephens in May. The model, who attended the British GQ's Men of the Year Awards with John Legend by her side, was dressed in a shimmery, tasseled ensemble as she had her locks pulled back in a chic up-do. The singer, meanwhile, looked equally stylish in a navy blue velvet suit complimented the white, silver and gold in Chrissy's gown. Besides sharing their fashionable looks, the couple also shared a cute moment when John gave his wife a kiss on the cheek. The proud mom's red carpet appearance comes nearly four months after she and John welcomed a baby boy on May 16. One day after the newborn arrived, Chrissy, who made herself debut in the annual Sports Illustrated Swimsuit Issue in 2010, announced the birth of the latest addition to the family, tweeting, "Somebody's herrrrrrre!" The couple also shares daughter Luna Simone Stephens, 2, together. They had announced the pregnancy news last November, with sharing an Instagram photo of Luna pointing to her mother's growing baby bump and yelling, "Baby!" Chrissy and John, who became married in September 2013, used in vitro fertilization to conceive both of their children.